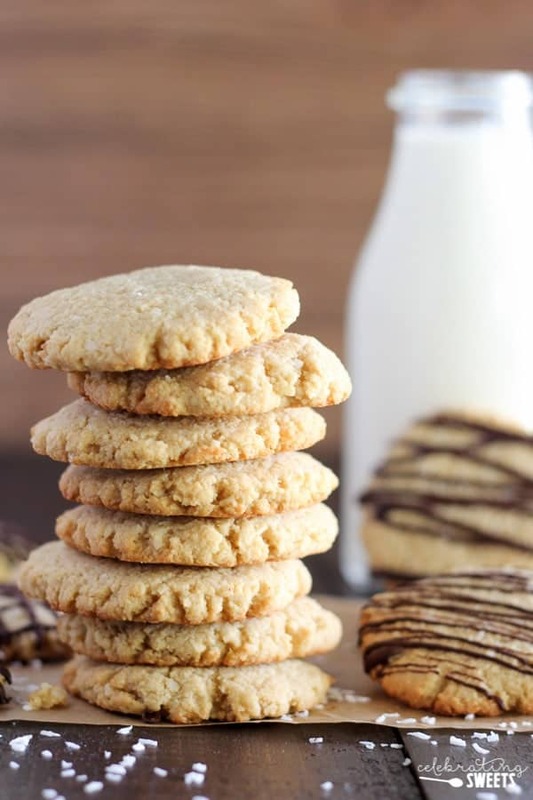 Naturally gluten free cookies loaded with a double dose of almond and coconut. 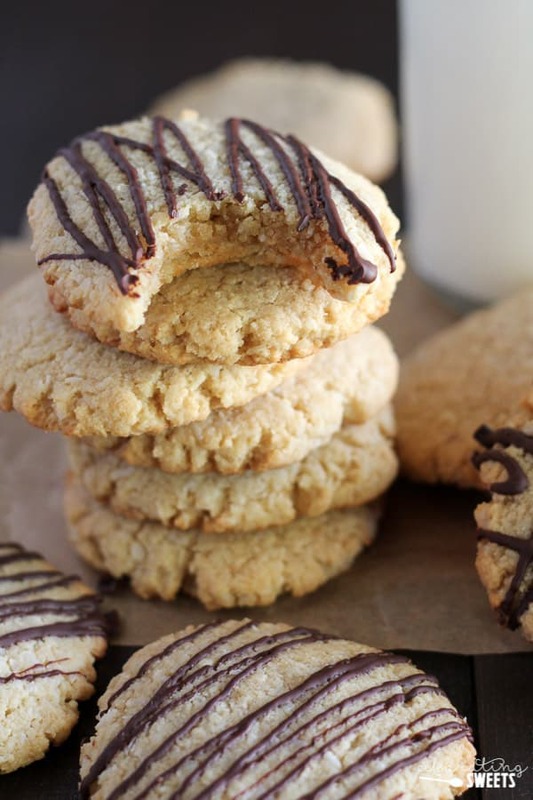 These soft and chewy cookies taste similar to a coconut macaroon and an Almond Joy candy bar. 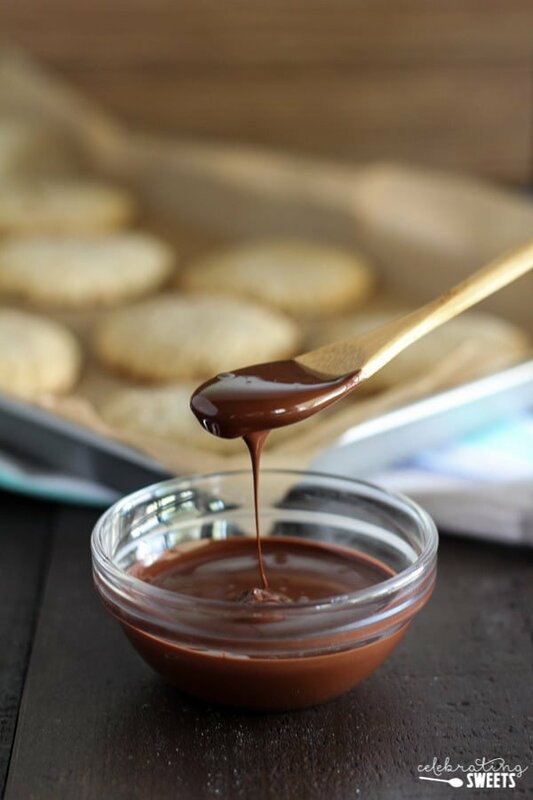 Drizzle with melted chocolate or eat them plain; they’re fabulous either way! I wish I had you all in my kitchen right now. 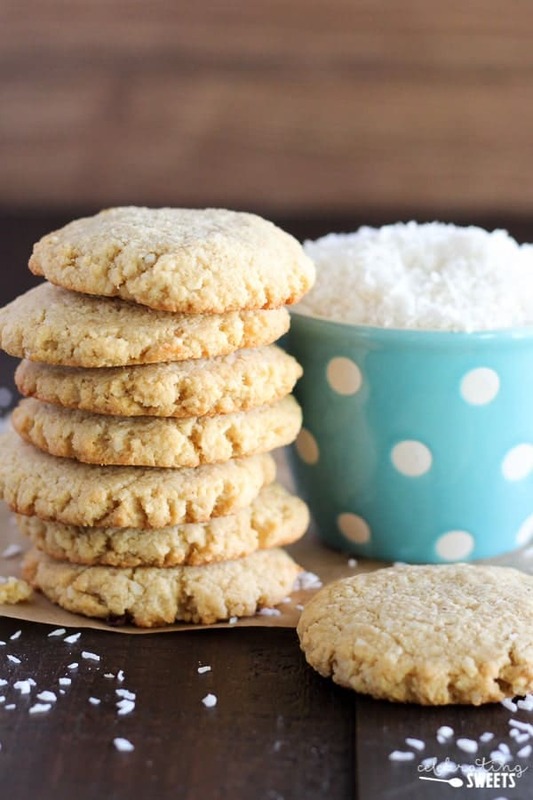 We could nibble coconut almond cookies, sip coffee, and chat about the important things in life – like these cookies. These are my new obsession; I’ve made this recipe twice in the last 24 hours. 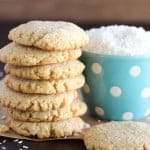 I’ve shared these cookies with family and friends, and they have been a huge hit. I know that once you try these you will LOVE them too. So get over here and help me eat ’em. Open invitation until the cookies run out! What’s so great about these cookies? They’re super soft and chewy with a taste similar to a coconut macaroon and an Almond Joy candy bar. 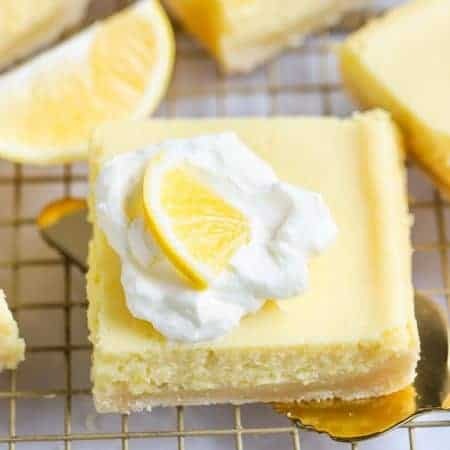 Almond flour and almond extract impart almond flavor, and unsweetened shredded coconut and coconut oil give a subtle coconut flavor. These cookies contain no refined flour, and they happen to be gluten free! I’ve had my fair share of mediocre gluten free cookies and these are nothing like those. I seriously can’t get enough of these. Now lets quickly talk chocolate. To drizzle or not to drizzle? I love the combination of coconut, almond, and chocolate, so I drizzled half the batch with melted dark chocolate. But, if you’re not a chocolate fan, or you prefer the pure coconut/almond flavor, just skip the chocolate. These are fantastic either way. I promise. Anthony’s Goods is a bulk gluten-free, natural/organic foods provider. Their products are sold in larger amounts to keep them affordable (plus, free shipping!). You’ve got to give them a try! They have many fabulous products for you to check out. And now I’m off to enjoy just one more cookie. See ya soon, friends! Naturally gluten free cookies loaded with a double dose of almond and coconut. 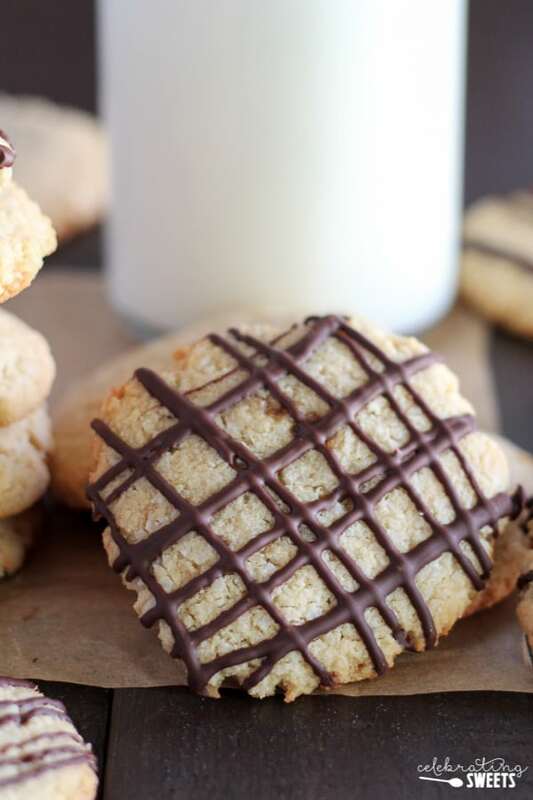 These soft and chewy cookies taste similar to a coconut macaroon and an Almond Joy candy bar. 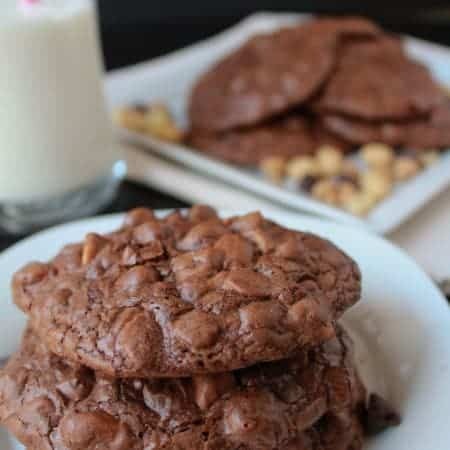 Drizzle with melted chocolate or eat them plain; they're fabulous either way! In a separate bowl, vigorously whisk eggs for 1 full minute. Add coconut oil, vanilla extract, and almond extract and stir to combine. Add wet ingredients to the dry ingredients and stir using a wooden spoon or rubber spatula. Stir until thoroughly combined; use your hands if necessary. Tightly cover and place in the back of your fridge (where it's really cold) for 2 hours or up to overnight. I just made these with pistachio flour for Passover. Amazing! I’ll definitly try them “as directed” soon. The dough is a little dry, but if you use your hands it should come together. The chill time is also important…did you chill the dough? 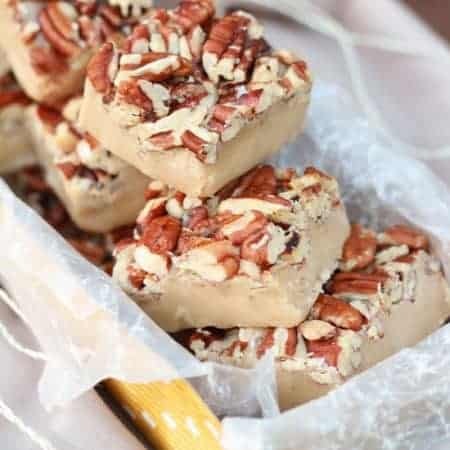 Wow just made these and they turned out perfect even though I didn’t refrigerate for 2 hours and I substituted brown sugar for 1/4 cup of truvia. They are chewy on the inside and crispy on the outside. Will be making more of these! Thanks for the recipe!! I added dried cranberries for sweetness and cut back on the sugar. Excellent!! Thank you so much for the recipe! I was inspired by the Calypso crunch cookies at Publix, but these are much better! Thanks for this lovely grain free recipe. I pressed some flaked almonds onto top of cookies before baking…delish! Scrumptious. Great for my son recently diagnosed with coeliac, but we all loved them. I added flaked almonds on top too. I’m glad that you liked them! Thanks for the kind review. Enjoy!